Most banks will charge you an interest rate ranging between 10% p.a. to 24% p.a., if not more. 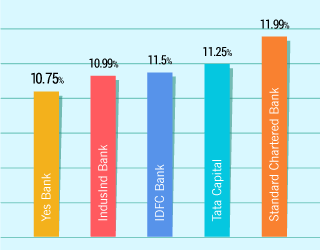 Loan providers like Yes Bank, IndusInd Bank, Citibank, ICICI Bank, Kotak Mahindra Bank, and Tata Capital charge low interest rates on personal loans that start from 10.75% onwards. Several other banks such as Aditya Birla Capital, HDB Financial Services, HDFC Bank, Axis Bank, and Ujjivan Bank charge slightly higher interest rates. However, these loans are characterised by low processing fees and other charges. Processing Fee: Loan providers levy a one-time charge known as the processing fee, which can increase the cost of the loan. Even if you are charged a low interest, it is important to check and compare the processing fee charged by different lenders. Pre-Closure Charges: Certain banks may charge you a pre-closure fee if you repay the outstanding loan balance before the completion of the loan repayment tenure. Make sure to check if the bank/financial institution that you are applying to levies a pre-closure charge. Customer Service: In order to have a good borrowing experience, it is necessary to apply to a lender that offers good customer service. Before submitting your loan application, you should check the customer care channels that are available and how prompt the lender is in providing you assistance when required. Eligibility Criteria: While the bank or financial institution may offer personal loans at low interest rates, you should make it a point to check if you meet the eligbility criteria specified by the lender. To this end, you should ensure that you check if your income meets the set limit and if you meet the age requirements specified. Loan Disbursal Time: If you are looking to take a personal loan due to an emergency, it is important to take the loan disbursal time into account. A number of leading banks and financial institutions disburse the loan amount within a matter of seconds. Other Charges: While the lender may charge you a slightly higher interest rate, you may be able to save on the overall cost of the loan if the processing fee, default charges, pre-payment fee, etc., are low. Thus, make sure you compare the various charges levied by the lender before applying for a personal loan. Discounts: Although the bank/financial institution may have specified a high interest rate, you can try to negotiate with the bank for a lower interest rate. Many-a-times, lenders will give a discount to existing customers and to those who have maintained a healthy relationship with them. Special Offers: Certain lenders may charge you a lower interest rate during festive occasions. *Some loan providers do charge a comparatively higher interest rate; however, you should take certain other factors into account before making a decision. Credit Score: Your credit score serves as an indicator of your repayment capacity and creditworthiness. Thus, if you have a high credit score, you will be a charged a lower interest rate, and vice versa. A credit score of 750 and above is considered good by loan providers. Income: Loan providers take the applicant’s income into account when deciding the interest rate. Individuals who have a high income pose a lower risk to the bank and, thus, might be offered a lower interest rate. On the other hand, those with lower annual incomes may have to pay a higher interest rate. Employer Details: If you work for a reputed organisation, the bank/financial institution is more likely to offer you a lower rate of interest. Nature of Employment: Loan providers may offer different interest rates to applicants based on whether they are self-employed or salaried. Age of the Applicant: The age of the applicant can also have an impact on the interest rate quoted by the loan provider. Individuals who are nearing the retirement age may be charged a higher interest rate. Relationship with the Loan Provider: Existing customers of the bank/financial institution may be offered a lower rate of interest at the time of applying for a personal loan, provided they have a good relationship with the loan provider. This is, however, at the discretion of the bank and not all existing customers will be offered a preferential interest rate. Among the various points that are mentioned above, the credit score of an applicant is one of the primary factors that is taken into account by banks and financial institutions to decide the interest rate. Make sure to check your credit score at the earliest to ensure that you are offered a favourable interest rate. The interest rate that you will have to pay when applying for a personal loan may vary based on a number of factors. The applicable interest rates are usually specified on the official websites of banks and other financial institutions. You can also check the interest rates offered by different banks through a third-party financial services website. The interest rate charged by the loan provider has an impact on the EMI that you will have to pay once your loan is disbursed. Thus, before you apply for a personal loan, it is advisable to use the personal loan EMI calculator tool to know the payable EMI. To use the EMI calculator tool, you will simply have to navigate to the respective website, after which you will be required to input certain details such as your desired loan amount, the tenure of the loan repayment period, and the interest charged. Once you key in the required details, the total EMI that you will need to pay on a monthly basis will be displayed. You will find the EMI calculator tool on the websites of banks/financial institutions and on third-party financial services websites. EMI = [PxRX(1+R)^N]/[(1+R)^N-1], wherein P represents the loan amount, R is the interest rate charged per month, and N indicates the total number of monthly installments. Mr. Mehta, a 33-year old IT engineer, is looking to apply for a personal loan to pay for his wedding expenses. He intends to apply for a loan of Rs.10 lakh and repay the loan over a period of 36 months. He expects to pay an interest of 14% p.a. for the loan. To calculate the EMI for the personal loan, he will need to navigate to either a bank/NBFC’s website or a third-party website that offers an EMI calculator tool. He will then have to input the loan amount, which is Rs.10 lakh, the loan tenure, which is 36 months, and the interest rate, which is 14% p.a. Upon entering these details, the EMI payable, which is Rs.34,177.63 per month, will be displayed. In his case, the total payable interest is Rs.2,30,394.67, while the total payable amount is Rs.12,30,394.67. Fixed Interest Rates vs. Variable Interest Rates – Which is better? If you opt for a personal loan with a fixed interest rate, you will be charged the same rate of interest throughout the loan repayment period. On the other hand, the floating/variable interest rate is linked to the Marginal Cost of Lending Rate or the MCLR, thus causing the interest rate to fluctuate as and when the MCLR changes. The benefit of opting for a fixed interest rate is that you know exactly how much you will be charged during the loan tenure. Thus, those who wish to plan their finances in advance can opt for a fixed interest rate. If you, however, don’t mind a fluctuating interest rate, you can opt for a floating/variable interest rate. The benefit of opting for a variable interest rate is that your repayment amount will reduce when the interest rate is low. Improve Your Credit Score: A high credit score indicates that you are creditworthy. Banks and financial institutions offer lower interest rates to applicants who have a high credit score. Thus, you should check your credit score before applying for a personal loan. If your credit score is lesser than 750, you should look for ways to improve it. There are more chances of you getting a personal loan at a low interest if your credit score is over 750. Avoid Missing Repayments: If you miss a loan or credit card repayment, your credit score may be adversely affected. Loan providers usually take your repayment history into account before deciding the rate of interest for a loan. Those who have paid their past EMIs and credit card bills on time are likely to be charged a lower interest. Keep an Eye Out for Offers: Banks and financial institutions usually offer special interest rates for a limited period of time during festive occasions. If you apply for a loan while such an offer is running, you may be offered a lower rate of interest. Compare Interest Rates: Before applying to a particular bank for a personal loan, it is necessary to compare the interest rates charged by various banks and NBFCs. This will help you avail a personal loan at a competitive interest rate. Negotiate with the Lender: If you are an existing customer of a bank or have a good relationship with the loan provider, you can negotiate for a lower interest rate. When doing this, it is advisable to submit a formal written request to the loan provider. Can banks change the interest rate during the loan tenure? If you opt for a personal loan with a fixed interest rate, there will be no changes to the interest rate during the loan tenure. If you opt for a floating interest, the bank may change the interest rate when the MCLR changes. Are personal loan interest rates fixed or floating? You can opt for a fixed interest rate or floating interest rate, based on the options that are provided by the lender. When you avail a personal loan at a flat interest rate, the interest is calculated on the entire loan amount throughout the loan repayment period. In comparison, if you avail a loan at a reducing interest rate/reducing balance rate structure, the interest is only calculated on the outstanding loan amount. Thus, in this case, when you make a monthly repayment, the interest for the remainder of the loan tenure will be calculated on the outstanding loan balance. Should I take a loan from a loan provider that offers the lowest EMI? While the EMI is an important factor to take into account, you should also consider other factors such as the processing fee, tenure of the loan, interest rate charged, repayment options, reliability of the loan provider, etc., when applying for a personal loan. How often does the variable or floating interest rate change? Banks will change the variable/floating interest rate each time the Marginal Cost-Based Lending Rates changes. Thus, the floating interest rate is a good option for those who are prepared for fluctuations in the interest rate. What is the average interest rate on personal loans? Most lenders charge interest rates between 10.99% p.a. and 24% p.a. for personal loans. The interest rate that you are charged will vary based on a number of factors such as your credit score, your income, the company that you are employed with, your age at the time of applying for the loan, etc. Thus, make sure to compare interest rates of different loan providers before applying for a personal loan. How can I lower the interest rate charged for a personal loan? To be offered a personal loan at a better interest rate, you should aim to improve your credit score. If you currently have a credit card or an outstanding loan, you should ensure that you don’t miss any repayments. You can also try negotiating with the loan provider to offer you a loan at a better interest rate. How do I benefit if the interest is calculated on a daily/monthly reducing balance? In the case of monthly reducing loans, the principal amount gets reduced each time you pay an EMI and the interest will only be calculated on the outstanding balance. In the case of daily reducing loans, the principal gets reduced on a daily basis and the interest is charged on whatever balance is outstanding. You, being the borrower, stand to benefit if you opt for a monthly/daily reducing personal loan since the overall interest that you will have to pay will be lesser. Is there any relationship discount on interest rates? If you currently have a good relationship with a loan provider, i.e. you are an existing customer of the bank/NBFC or you have availed a loan in the past for which all repayments were done as per schedule, you may be offered a preferential interest rate. However, this does not mean that all existing customers who apply for a personal loan will be offered a discounted interest rate. How does balance transfer help you get a lower interest rate? Balance transfer is a process by which the borrower transfers their outstanding loan balance from their current loan provider to a new loan provider. The primary benefit of doing this is that you can transfer the outstanding loan amount to a bank/financial institution that offers a lower interest rate, thereby reducing the overall interest that you will have to pay during the loan tenure. Nowadays, individuals are able to buy houses, cars, and travel around the world easily when compared to earlier because loans are available much easier. However, availing a personal loan affects an individual when the Equated Monthly Instalments (EMIs) start and the amount of savings reduces. During these circumstances, if there is an inflow of cash because of a salary hike, bonuses or business profits, the best option one should consider is to pre-close the loan. The cash flow of the household being affected due to the high EMIs, if the amount is lying idle in the bank account, and the loan tenure are some of the factors that individuals must consider when preclosing a loan. In case the EMIs are affecting the cash flow on a regular basis, individuals can consider making a pre-payment so that the EMIs can be reduced. Individuals can also look to invest the amount, however, the returns of the investment must be considered. In case individuals want to pre-pay a home loan, tax benefits are also provided under Section 80C and Section 24. Therefore, it is vital that individuals consider all options before deciding on the pre-closure of the loan. Finance wise there has been a host of changes that have occurred over the last five years. Encouragement to home buyers, tax norms changes, a shake-up that was caused by demonetisation, the Unified Payment Interface (UPI), and the introduction of MCLR have been the major changes that have occurred under the Modi government. Some of the impactful changes of the last five years have been taxation, digital payments, transparency in interest rates, and the Pradhan Mantri Awas Yojan (PMAY). The tax-exempt income has been increased from Rs.2,00,000 to Rs.5,00,000 as of 2019-2020. The 10% slab was also abolished in favour of a 5% slab. Digital payments also hit an all-time because of demonetisation. The introduction of UPI has also made it much easier for individuals to transact money. In a move that would help consumers know if there is any cut in interest rates, the Reserve Bank of India (RBI) migrated from the base regime to the MCLR regime. The introduction of the PMAY scheme has also made it marginally easier for middle and low-income individuals to be eligible to own a house. State Bank of India Gold Loan: SBI offers this loan at 10.55% interest rate. The rate varies based on the purity of the gold. The loan amount ranges from Rs.20,000 to Rs.20 lakh. Borrowers can choose a loan tenure between 3 months and 36 months. HDFC Bank Gold Loan: The bank provides a per gram estimate of the amount people can borrow against the pledged gold. The amount ranges from Rs. 1,897 to Rs. 2,319 per gram. The maximum loan amount is Rs.50 lakh and the maximum tenure is 24 months. Muthoot Gold Loan: The per gram estimate is based on the gold's purity and ranges between Rs 1,889 to Rs 2,309. Borrowers can avail a loan amount between Rs 10,000 to Rs 2 crore for a maximum of 36 months. The interest rate is set at 12% p.a. Manappuram Gold Loan: The per gram estimate ranges from Rs 1,897 to Rs 2,319 based on the purity of the gold. Maximum loan of Rs.1 crore can be availed for up to 12 months at 12% interest p.a. Most individuals keep receiving calls or messages that have a pre-approved loan or a credit card. While most ignore them, some of them tend to take up such loans or credit cards. Such pre-approved loans are a way for financial institutions and banks to offer credit to their customers. According to TransUnion Cibil Ltd., credit card accounts has seen an increase of 28.60% between December 2017 and December 2018. During this period, personal loans have also seen an increase of 29.30%. Auto loans and home loans have seen an increase of 10% during this period as well. Retail attraction, data analytics, and the ease of taking loans are some of the main factors why banks tend to offer retail loans. The quick disbursal process also plays an important role for the increase in personal loans. Individuals usually get the money deposited into their accounts within a day when availing a personal loan. However, it is important for individuals to take up such loans only when needed. Any default on a personal loan payment can affect the credit score of an individual and he/she would find it difficult to get a personal loan in the future. The Reserve Bank of India (RBI) has decided to hold more consultations with stakeholders before they implement a scheme where small floating rate loans will be linked to an external benchmark. This would help in the improvement of monetary transmission. During the first bi-monthly policy review, the RBI issued a statement in which it said that they have taken feedback from stakeholders during their discussions in regard to issues such as management of rate of interest risk by banks and the other difficulties which are related to it. During the review of the monetary policy, which was held during December, the RBI had proposed the implementation of a system of linking floating rate personal or retail loans and floating rate loans to Micro and Small Enterprises (MSEs), to an external benchmark from 1 April 2019. In India, the number of women entrepreneurs when compared their male counterparts is shockingly low. Although the Micro, Small, and Medium Enterprise (MSME) sector is bustling with creative ideas and businesses, the number of women involved in the same is low. In a bid to encourage more women to take up entrepreneurship, the governments of various states as well as the central government have introduced various financial schemes. The Mudra Yojana Scheme from the central government offers aid for women who want to start a small business of their own like a beauty parlour or a tuition centre. It is also available to small women groups. The amount of loan available starts at Rs.50,000 going all the way up to Rs.50 lakh. Collateral is needed only for loans greater than Rs.10 lakh. The Annapurna Scheme cater to the needs of women who want to start a food business. Loans (guarantor needed) of up to Rs.50,000 are available for procuring essential kitchen equipment. These loans have repayment tenures of up to 3 years. Another scheme known as the Cent Kalyani Scheme is designed to aid women entrepreneurs involved in retail trading, agriculture, and the like. Loans up to Rs.1 crore are available without requiring collateral or guarantors. The Annapurna Scheme caters to the needs of women who want to start a food business. Loans (guarantor needed) of up to Rs.50,000 are available for procuring essential kitchen equipment. These loans have repayment tenures of up to 3 years. TransUnion CIBIL has reported a 31.3% growth in unsecured lending during the last quarter of calendar year 2018, compared to the same period a year ago. The report noted that unsecured lending categories including personal loans, credit cards, and consumer durable loans continue to be the key driver of the Indian economy. In comparison, secured lending categories also witnessed substantial growth during this period. As per the report, home loans witnessed a 17.1% growth, auto loans grew by 17.4%, and loans against property expanded by 21.4% during the fourth quarter of calendar year 2018. This information was revealed by TransUnion CIBIL in its industry insights report. The report noted that this high demand for credit indicates healthy growth levels for the country’s economy. Credit demand is strong in the country and lenders have met the demands put forth by customers. Though the country’s GDP has slowed down in the recent quarters, the rate of consumer lending witnessed in the country is still higher than most other major economies in the world. A personal loan is one of the most versatile loans available in the market but with the inception of secured gold loans, customers have more options to consider. Personal loans are unsecured loans that do not require any collateral. You can use it to meet a multitude of financial needs. Unlike home loans and car loans, personal loans have no specific purpose for its usage. Since customers do not have to pledge any assets, it is especially helpful during financial emergencies. The funds are disbursed within 24 hours to 48 hours and require comparatively less paperwork. The repayment tenure for such loans ranges between 12 months to 60 months. Unlike personal loans, gold loans are secured in nature. Customers can avail this loan against any gold assets they have which are not currently in use. It is a wise way to utilize such idle assets. Gold loans are sanctioned according to the purity of the gold. Since this loan is secured in nature, the interest rates are comparatively cheaper. Gold loans have a fast processing time and do not require a high credit score necessarily. There have been several developments that have led to digital lending becoming easier and hassle-free. Some of these changes have been the launch of eKYC, which facilitates the Know Your Customer process of verification to be done digitally using the mobile OTP or biometrics, and eSign, which enables the digital signing and submission of documents. The launch of IndiaStack, a unified software portal, lent a further boost to the digital lending in India. Alternative digital lending platforms make it possible for people to borrow money irrespective of their geographical location. The loan approval and disbursal process is also shortened which makes it ideal for those who are facing a financial crunch and want money instantly. Borrowers are also given the right financial product through the combination of data analytics algorithms and AI. The submission of relevant supporting documents is also paperless and quick. It is also stored in a digital database which makes it easier when the borrower wants to apply for additional credit. While the traditional lending platforms such as banks may have taken days, today digital lending platforms take just a couple of hours for the entire loan application and disbursal process.